A journey in search of a stolen life. This cross was hand-carved by my daughter to mark my grandmother’s grave. My grandmother, Annie, died in 1959 and the marking of her grave also marked the end of a journey which began some years ago; a journey to discover the truth buried beneath the wreckage of Annie’s life. I requested and obtained permission to view the records that were kept by Talgarth Mental Asylum when my grandmother, Annie, was incarcerated there for 18 years of her life, from 1930. The victim of terrible domestic violence, her husband had Annie committed for depression. Annie was taken from her nine children, one of them still a babe in arms. The records show that she tried to escape to get home to her children but was captured and taken back. My mother grew up believing Annie didn’t want to come home to them because that was the lie their father told them. The records made for harrowing reading. I spent a day in the archives, faithfully recording every entry in that massive, leather bound tome, and did not allow myself to weep until the journey home. I vowed I would write her story one day. It is a promise I intend to keep. I didn’t write it at that time because it was too close to my heart, too harrowing, just too overwhelming in every way. My day at the archives was the end of a long journey which had begun with researching my family history and ended with a burning passion to write fictional stories portraying the real difficulties faced by women in the past, the culmination of which is my three novels in the Megan Jones trilogy. At the end of the farm lane I saw a signpost and my heart leaped with hope because I’d imagined the old place would be no more than a derelict pile of stones in some isolated place. As I drove up the track, with the wind blowing and the April sun breaking through the clouds, a flock of crows rose up, as one, from the field. Flying against the wind, they twisted and turned overhead before soaring away and my spirits soared at the sight of them. The mass of the Eppynt mountain loomed ahead as the lane steepened towards a brow in the hill. I felt a tug of the heart and a sob rose in my throat – on the edge, as I was, of arriving at the place where dear Annie’s life began. Sadly, on my arrival I was to discover that nothing remained of the house where Annie was born. It had been demolished to make way for cowsheds. It is symbolic, in a way, because the life my granny Annie expected to live was raised to the ground, obliterated, as surely and ruthlessly as the house where she was born. My family history, like all history, is liberally sprinkled with women whose lives were blighted; by the inequalities of society or through the neglect, stupidity or downright cruelty of others – a pattern I’ve seen repeated in my own life. Most of what I know of Annie comes from the stories of other people who knew her, and from the medical records of the asylum. The medical records state bald facts, which in the light of all else I know, are all the more distressing. My granny had beautiful black hair of which she was very proud. By day, she wore it plaited and rolled into a bun at the nape of her neck. At night, she undid that plait and let her hair fall down. It was so long, she could sit on it and with the help of her little girls, it was given 100 brush strokes, every night before bed. When she was carted away to the asylum, she believed she was going to have a short rest. Her nightmare began on arrival. The first thing they did was to chop off her hair, her beautiful long mane of glossy, black hair. It was a standard procedure; head lice being rife in such institutions, long hair would pick them up and spread them like wild fire. She must have been a stunner, Annie, before hard toil, nine children, and a poor diet ravaged her. It was noted in their ledger that she had grey eyes; a stunning combination with that long black hair. She was underweight and undernourished and had an overactive thyroid. She was on her last legs when she entered that place and they all but knocked her legs from beneath her. What hellish place must she have thought she’d been brought to? This was no rest home, no holiday, this was hell itself. She tells them a mistake has been made and they must let her go immediately; home to her children who would be worrying where their Mam had gone. She tells them why she has been unable to cease crying (the reason given for her admission); that her husband knocked her about and threatened to kill her. The following are some of the comments written in their ledger, repeated year after year. For eighteen years, every time she was interviewed by a psychiatrist, Annie told them the same story about her husband. Every time she told it, it was seen as evidence of her delusional madness. The tragedy is that she spoke the truth. Her husband was a brutal man and he had, indeed, knocked her about for years, and attempted to murder her, strangling her by the throat in one of his rages. He would have succeeded if he had not been dragged off by his oldest daughter and two sons. It was her husband who was the lunatic, and he had succeeded in carrying out his threat to get rid of her, not by killing her but by having her incarcerated in the asylum he should have been in himself. The reason for her committal was her continuous crying. One of the psychiatrists described her, unsympathetically, as emotionally unstable, confused, and lachrymose. I’m sure if he had been in her shoes, he would have been all those things himself, would not have diagnosed himself as insane but as showing a normal response to the irrational and abusive treatment meted out by her husband. Annie suffered a most terrible injustice. She should have been protected but instead she was locked up in the asylum in 1930 and did not get out until 1948. Cold blooded murderers do less time. Annie suffered what she did, for as long as she did, because she spoke her truth. She had no idea that in speaking the truth, she was providing them with the ‘evidence’ to back up their misguided theories as to her mental state. I would like to be able to say that such injustices were few and far between, but in truth they were all too common. As recently as 2007, a lady of 85 years of age was finally traced by her family, 70 years after being committed to an asylum in 1937, under the 1890 Lunacy Act. She was 15 when she was committed for the ‘crime’ of stealing half a crown from the doctor’s surgery where she worked as a cleaner. The money was later found, but too late for this poor girl. She spent the rest of her life being shunted from one mental institution to another, until she was moved to a care home in her old age. Many of these dreadful places were closed down towards the end of the 20th century. Stories abound of how these elderly ladies then being released had been placed there as young girls of fourteen or fifteen, for the ‘crime’ of having illegitimate babies. Yet, no man was ever imprisoned for having fathered one. So many lives were never lived. Such cruelties were commonplace. Before her death in 1797, Mary Wollstonecraft was writing a novel entitled Maria; The Wrongs of Woman. The novel’s heroine, Maria, has been placed in a madhouse by an abusive husband who seeks to control her money and her liberty for his own ends. In those days, it was only too easy for a man with money to have his unwanted wife committed to a privately paid asylum. The parallels between Annie’s story and Wollstonecraft’s heroine, Maria, are obvious. Both were sent to the madhouse by duplicitous husbands and for spurious reasons. I’m sure Mary Wollstonecraft must have hoped that one hundred and fifty years after her death such things would not still be happening. In Annie’s case, it seems that her continued incarceration for so many years was due to laziness on the part of those who could have properly helped her; they chose not to investigate whether what she was saying was true, and chose instead to reaffirm their own misguided beliefs. There is no changing the past. What is done cannot be undone. But I hope that in the telling of Annie’s truth some small piece of justice will finally be hers. Incidentally, the mental asylum that played such a part in the demolition of my granny’s life, was itself demolished in 2011. Treasures amid the ruins of past lives. We had reached the ruins of Hafod by then, and I remembered how, years ago, Morgan and I had played in this ruin as children. We’d ride over here on our ponies. Back then, there were still remnants of a roof and the outside walls were intact. We’d light a fire in the hearth, though the chimney was full of crow’s nests. Sian talked as we picked our way round the crumbled walls of the house, stepping over roof slates overgrown with weeds, and stooping to pick up bits of broken china cups and such. A ‘ hafod’ was a summer dwelling or place. My earliest traced ancestors lived in a place called Hafodeidos. Its English translation conjures up an 18th century rural idyll – the summer place of the nightingales. The name of Hafod has ancient origins, harking back to a way of living which was practiced by the early Welsh people. They lived according to a semi-nomadic system of transhumance. In summertime they lived in summer dwellings called ‘hafod’ which were situated up in the mountains. Their animals grazed on the rough mountain pasture while the family lived in the ‘hafod’, which was no more than a roughly built hut but served as adequate shelter through the summer months. They lived off the milk and cheese they acquired from the freely grazing cows and sheep. Loving to roam the Welsh mountains as I do, this seems to me to be the most idyllic of existences in summertime. Only when winter drew near would the family make their way down the mountain to live in their winter dwelling. This was called a ‘handref’ and provided better shelter from winter weather while offering some protection for people and animals from the wolves which then roamed the Welsh countryside. 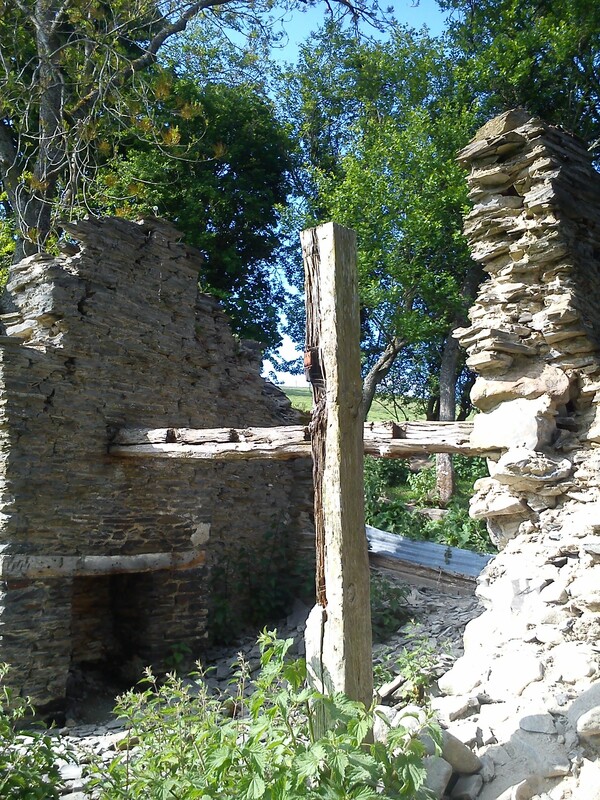 I failed to find anything but ruins of many of the homes of my ancestors. Long abandoned, due their remoteness or inaccessibility when transport became motorised. Many of the old tracks remain, now marked as bridle-paths or footpaths, when once they would have witnessed the weekly trundle of cartwheels, carrying the family to market or chapel. 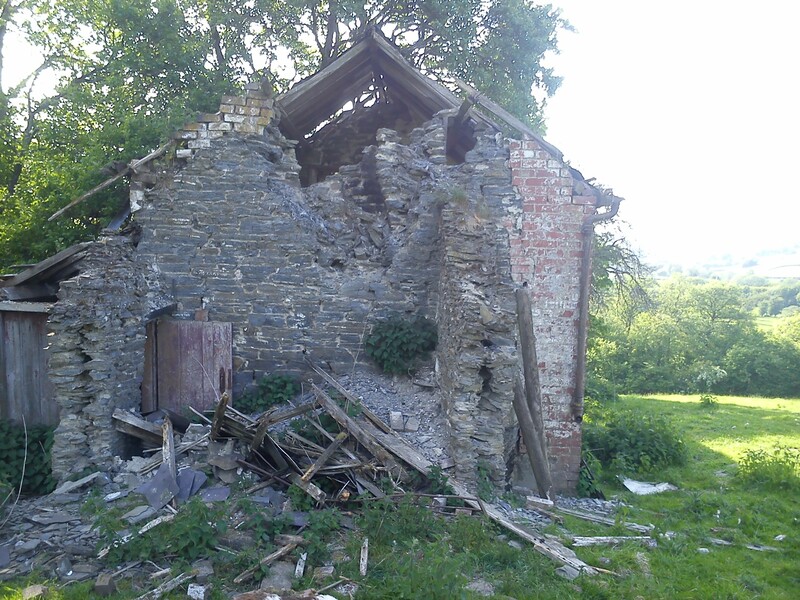 If you walk anywhere in the Welsh countryside, you will still encounter the occasional ruin, tucked away on some remote hillside. Often, as in the photos above, the only thing still standing is the chimney wall, complete with beam-topped fireplace. Slate tiles litter the ground amidst the fallen stones, and the remains of broken china lie scattered about among nettles and grass; a cup-handle here, a shard of plate there. As I walk amid the ruins of long-since crumbled homes, I am always left wondering how many children were raised or died within that house; how many couples lived, loved and died between its walls? That is the pull of old ruins, for they hint at the stories lost to history, leaving us writerly souls to fill the gaps with our imaginations. As I trample among them, I fancy I hear the sound of children’s laughter, and their footfalls chasing about boarded rooms that no longer exist. I imagine glimpses of petticoats, pinafores, waistcoats and breeches; always just around the corner, hidden from sight. A family of eighteen children were raised in the house above, within living memory. Opposite that chapel, was the ruins of what was once the chapel house. Damson trees grew behind what remained of its walls and we’d clamber up those trees in autumn, to harvest their purple fruit. There is nothing but grass and weeds to be seen there now. The earth has swallowed its remains and covered them over as if they had never been. 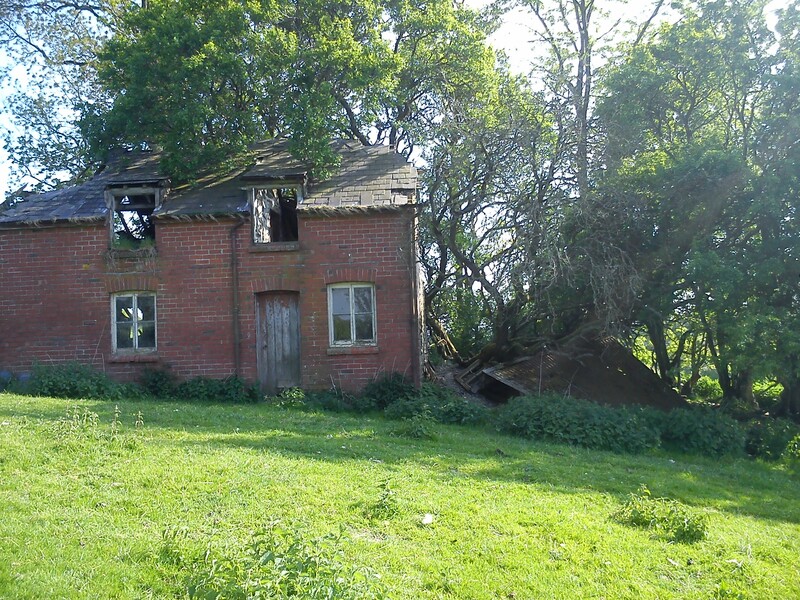 The same has happened to the cottages which were once said to exist below our old farmhouse. Not even a grass-smothered outline remains of one of them. Nature has gathered them all into her bosom, obliterating man’s attempts at permanence, and returned the fields to her beloved green. The extraordinary is to be found beneath the ordinary. Within the lives of ordinary people, extraordinary stories can be found. Inscribed on ancient tombstones, between the lines of census entries, or beneath the scattered slates and stones; dig deep enough amid the ruins of the past and there is treasure to be found.